Hyperemesis Gravidarum has literally taken over my life. it has made me feel things I never thought I could feel. it has consumed all my energy and taken more from me than I will ever be able to explain. 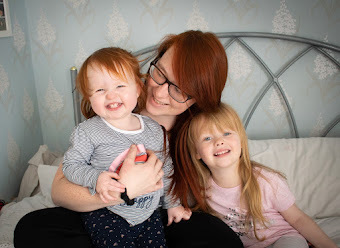 When I was pregnant with Emily, I had serious morning sickness, at the time I thought it was horrendous, I was sick from the moment I found out I was pregnant and was still being sick during labour. Little did I know, it can get worse. A lot worse. 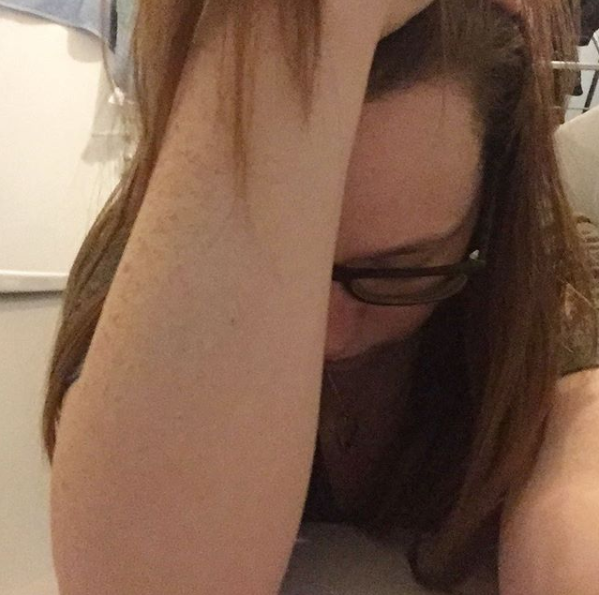 I have literally been unable to do anything, I lost my independence, I haven't been able to cook, oh and the mum guilt, it is the absolute worst. I have become so dependent on medication and Sam that I feel useless. The other thing I have found really hard to deal with is the misunderstanding of the condition. HG is hard, so hard but it’s so much more than just sickness. Unfortunately, no amount of ginger or flat lemonade is going to help. When I first found out I was pregnant, the sickness was bearable, sure I was being sick morning, noon, and night. it was exhausting and let’s be honest, no one likes to be sick but as the days went past it got worse. The nauseous feeling didn't go away, even after I had been sick, I still felt sick. Then came the sleepless night, and constant retching which leads to me pulling all the muscles in my stomach. As time went by being sick 10 times a day soon advanced to nearly 50 times a day, it was relentless and was literally taking everything I had. I felt drained from the lack of sleep, I didn't want to move away from the bathroom because I was scared I wouldn't make it back in time to be sick again and in all honesty, I just didn't have the energy to move. I literally thought that things couldn't get any worse, but they did. A couple of weeks had gone by, and I had tried to manage the sickness myself which looking back on now, I know I should have got help sooner. I sat on the sofa with Sam and just burst into tears. in those short two weeks, I had lost 1 stone 2lbs. I had pulled all my stomach muscles. I had no energy. The smell of food made me sick, I couldn't even order online shopping as that was enough to make me sick. nothing would stay in me, I was still being sick constantly and there was just nothing left, so I was just bringing up stomach acid which burnt my throat on the way up. gross I know. In that moment, I just said enough is enough, I think I need to go to the hospital. the realization of just how bad my sickness was finally settled in. I knew I was dehydrated but there was nothing I could do about it. A sip of water would make me sick, no matter how hard I tried, it just wouldn't stay down. On admission to the hospital, I was told that my urine tested +++ for 'ketones' - a word that ever HG suffer comes to dread. Excessive Ketones in your urine indicates that the body is not using carbohydrates from food as fuel, and is basically trying to break down your body’s reserved fats as fuel. Having ketones is a sign that the body is beginning to operate in starvation mode. The fact that I was severely dehydrated and testing positive for ketones meant I had to stay in the hospital and be put on a drip. So, I'm sitting in a hospital room, all alone because Sam had to take Emily home. A hospital is not a great place for a toddler anyway and there is no use me letting them stay and sit here waiting for me when I know full well it is going to be such a long night, and I have to have bags and bags of fluid to try and re-hydrate my body. I know from my previous pregnancy (as I was admitted with dehydration then too) just how long it can take. I sat and cried to the doctor, telling her just how bad I felt, and everything that has been going on. She diagnosed me with Hyperemesis Gravidarum, which I thought was just a fancy way of saying sickness - boy was I wrong. She has just sat and gone through all the symptoms/side effects of HG, most of them which I unfortunately have. prolonged and severe vomiting, unable to eat and drink without vomiting, weight-loss, dehydrated, headaches, and dizziness. HG isn't helping my moods either, as well as feeling exhausted, I am also feeling depressed. I find it so hard to express how or why I’m feeling this way, as someone who has battled with depression for a long time, I know the depression I am feeling isn't like that. I know that I’m feeling depressed because I feel so blooming useless. I know it sounds silly but I just don't feel pregnant. I have seen little bean on the scan, and I know that I am for sure pregnant, but it just won't sink it. I just feel ill. I also feel isolated, I can't go out because I'm afraid to be too far away from home encase I am sick. I don't know anyone who has had HG either so I can't exactly ask anyone for their take on it, or what they found helped - if there even is anything that can help? Honestly, how can I go on with my pregnancy feeling like this? Don't get me wrong, having a baby is an absolute blessing and I am so grateful, but I am really finding it hard. simple things such as getting a shower or shopping seem like impossible tasks. Sitting in this hospital room hooked up to this drip by myself isn't helping either because I feel like I am just wallowing, focusing on the negative and not the positive. I know there are a few positive things, like the fact I am growing a little human, and Emily is going to be a big sister and I know she will be an amazing one. I'm am also so lucky that I have Sam because he has been brilliant, picking up the slack and doing the cooking but the guilt and the depression are literally eating me inside out. I was so thankful for my bestie Toni, who was able to come pick me up from the hospital and take me home as by the time I was discharged from hospital it was late at night. Emily was already tucked up in bed and I didn't want Sam to have to get her out of bed to come and get me. The doctors prescribed me medication to help manage my sickness, and I am on 50mg three times a day. While it doesn't prevent, me being sick, it has subsided the nauseous feeling and reduced the sickness to about 0-5 times a day instead of 50. I'm hoping that since the sickness my stomach muscles are going to get a chance to heal. Since being on the medication I can keep small amounts of fluid down, I'm also able to eat small amounts of food which sometimes I even manage to keep down - I will take small victories wherever I can get them. I am writing this at 17 weeks pregnant - with the hope that it will help someone else, to know that they are not alone. Even though the midwife advised me that HG usually subsides around 15 weeks that isn't the case for me. I am still suffering. HG doesn't leave you, as I mentioned, the sickness is a bit more controlled but it is still impacting everyday life for me. I have lost a grand total of 2stone 8lbs. I feel dizzy all the time, the side effects of my medication are extreme tiredness, so I by 6 pm I just can't stay awake any longer. I wish I could sleep the days away, but that isn't a realistic expectation especially as I have a hyperactive two-year-old to contend with. I have little to no energy, and the mum guilt is terrible. Emily and I usually do lots of crafts and sensory activities which I have really struggled to muster up the energy to do. The most we have managed is colouring and playdoh. I have to keep reminding myself that she is happy, and I am doing my best because I want to be able to do more with her, I want to be back to my normal self, but I just can't. I am also really missing cooking, which is another thing I am unable to do. The smell of food makes me sick to my stomach, luckily Sam has been cooking meals, but then again, I feel guilty with that too as he is at work all day, then coming home to make dinner and do the bedtime routine. The isolation that I am feeling is really hard to deal with too, I guess that is why I have been writing these pregnancy diary entries and blog posts - even though I haven't been publishing them as I just haven't had the energy I intend to and I am glad that I have managed to write little snippets here and there. Emily has been amazing through this whole thing. She knows mummy is growing a baby, and that I am feeling poorly. She has been so kind and caring too which I am so thankful for, I am really proud of how she is dealing with the whole thing. At just two years old her understanding of the situation has blown me away. When she hears, me being sick she will come into the bathroom and rub my back, and ask if I am ok. She constantly gives me cuddles. She is enjoying the fact she is getting pack lunches (like a big girl as she will say) - I have been able to make these when I wake up in the morning, which is when my nausea is the easiest to deal with. It then means come lunchtime when I feel really sick, I don't have to contend with the smells of rustling up lunch for her, I can get her little lunchbox and give it to her. I hope if you are reading this and suffering from HG, it has made you feel less lonely. Please don't suffer in silence, go to the doctors, and seek help, although they don't always understand they can at least give you anti sickness medication which won't cure it, but it will take the edge off. Also, remember, don’t feel guilty about how you feel. I know it is easier said than done, and I have been constantly beating myself up because of the guilty, but you are ill, just like I am and it is not your fault. It’s just a crappy side effect of pregnancy. I could of written this myself. 10yrs since i have had my 1st and now preparing for trying for no2 means alot that there is no so much more support. Those days on a drip were the worst for me. I have also suffered HG three years ago when my daughter was born. I can relate to everything written in this quite frankly I found it quite hard to read. Being this sick put me in such a dark place. It makes me never want to have another child again, I feel it just wouldn't be fair to my daughter I don't think she would understand why I am so sick . And from what I hear the second pregnancy is much worse than the first and I can't even come to comprehend how that even possible . Every time I just get a little tummyache I panic I start to think is this gonna last eight months . My daughter was born premature at 35 weeks she is perfectly healthy now but HG caused me to going to preterm labour at 20 weeks 25 weeks and 35 weeks. By 35 weeks the doctors just let me go due to bleeding that was also caused by HG. No one can really understand the way that you feel and less you physically been in this position. I know there is absolutely nothing that can be said to you to make you feel any better. But I'm thinking of you today and I hope your pregnancy goes as quickly as possible and your baby and yourself are as healthy as can possibly be.